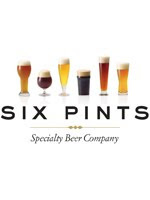 Obviously there has been a lot of talk about what exactly is the Six Pints project, what can be expected from the Toronto location, how is Molson's involved, what are the contributions from Granville Island and Creemore Springs and what good can come out of this experiment. Today I was fortunate enough to be invited for a tour and chat with Aaron Bilyea, Director, National Marketing and Specialty Sales, Todd Fowler, Trade Brewer and Stephen Rich, Assistant Brewer (and of DefinitionAle.com fame). I talked to them about the concept, what people can expect from the location and get a feel for the experience and vision that they hope their "Beer Academy" will be. inviting is what you get here. 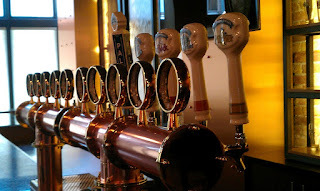 From custom draught taps, specially shaped glassware to enhance each style of beer, to a glass washer that uses extreme high temperature sanitation in order to avoid any chemicals that could affect the taste of the beer, the team has been busy ensuring that can be a destination to expand one's knowledge and appreciation about all things beer. Right down to a couple of special Russian supplied growler filling station that purge the sanitized vessle with CO2 prior to the cascade filling with beer to take with you, everything is well thought. Even behind the scenes, the have kept this attention to detail. With attention to the small details, even the draught fridge is meticulously organized and tidy. 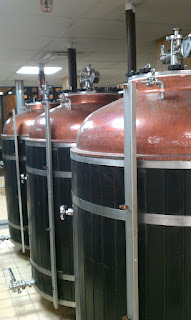 In trying to keep the original brewing equipment, they have extensively tuned up every vessel. New pressure valves, thermometers, triclaps et al, this team has been extremely busy. 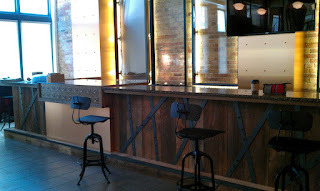 As with the artisanal physical brewing space, the mission and vision seems to be inline with the craft beer philosophy. Brewers Todd Fowler and Stephen Rich have been given autonomy in crafting recipes, sourcing ingredients and creating the beers that with be served and sold here. Not being under the pressure or control of the parent company with allow them the freedom to create and explore the styles and flavours that excite them both. This rejuvenated space will be a great resource for beer lovers to see what goes in to making beer, a spot to read about beer and brewing, a place for licencee training as well as both private and corporate events. It even sports a kitchen to cater to beer pairing dinners and a place to explore recipes that include beer. If everything lives up to the vision, this could be an amazing place for beer and beer lovers. It's success will have a huge impact on Molson's and how they react to the direction beer has been taking over the last decade or more. Smaller batches, different and bold flavours, getting back to the craft and art in beer making rather than the perfectly executed science and marketing experiment it has become for the macros. This beer lover would like to believe that only good can come out of this. So before you write it off as the macros trying to ruin craft beer, remember that there are some seriously passionate and knowledgeable beer geeks involved in creating this space, vision and the beer that will eventually be flowing at 75 Victoria Street in Toronto. I am optimistic about the possibilities. So Molson's is putting their huge resources to work to muscle more genuine craft brewers aside. And they are being congratulated for it. Really??? Here is to the genuine Canadian craft brewers who put their money and efforts on the line to lead the way, and here is hoping that this newest Molson effort to jump on the bandwagon is seen for what it is.